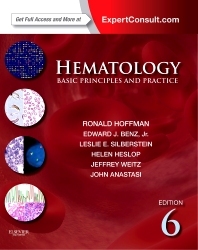 Hematology, 6th Edition encompasses all of the latest scientific knowledge and clinical solutions in the field, equipping you with the expert answers you need to offer your patients the best possible outcomes. Ronald Hoffman, MD, Edward J. Benz, Jr., MD, Leslie E. Silberstein, MD, Helen Heslop, MD, Jeffrey Weitz, MD, John Anastasi, MD, and a host of world-class contributors present the expert, evidence-based guidance you need to make optimal use of the newest diagnostic and therapeutic options. Make confident, effective clinical decisions by consulting the world's most trusted hematology reference. Access the complete contents online at www.expertconsult.com, with a downloadable image collection, regular updates, case studies, patient information sheets, and more. "This outstanding book will be a great resource to hematologists in practice and in training all over the world. It is current and, with plans for continually supplementing the online version as more information becomes available, it will continue to be up to date." "There has been a significant improvement in general layout and visual appearence between the 5th and 6th editions. The book is now in full colour throughout, with numerous sections of added and useful information contained in blue and red coloured boxes...The entire text of the book, including downloadable images, is available online, and includes updates to the book - such as the recent addition of arsenic trioxide and ATRA as treatment for acute promyelocytic leukaemia...for the truly discerning haematologist, only th fullest detail will suffice, and only Hoffman's Hematology: Basic Principles and Practice will do."